Use caution when using insecticides. Do not breathe in the fumes and do not get it on your skin. Don't give up if a treatment doesn't work the first time. Often, it takes many doses or different treatments to get rid of an ant problem. Keep your yard clear of trash and food. Both of these attract ants. 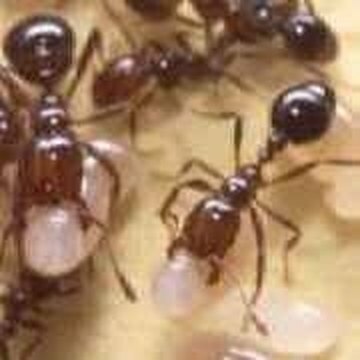 If your ant problem is larger than you can handle, contact a professional pest control person in your area. Tiny, black, beaded pests are invading the trees in your backyard yard and you have no clue how to get rid of them. It might seem like a huge problem, but with a little help from this article, you can overcome the ant infestation and clear your yard up in no time. Find ant hills or homes near or in the tree. After you find the place where the little creatures dwell, pour about 2 gallons of boiling water on their home. This will kill the ants inside and also wash away the hill. Mix a 50/50 solution of baking soda and icing sugar. Disperse the solution around the tree. The ants will be attracted to the sweetness, but once the eat it, it will expand in their bodies and cause them to explode. Purchase Diazinon or other ant-killing potions at your local home improvement store. Follow the directions on the bottle carefully, but do not use it around pets or children. Sprinkle chalk around the tree. Ants will not get near chalk. You can put a line of chalk around the base of the tree and they will not cross it. You can also purchase ant chalk, which has insecticides in it for added protection. Use Tanglefoot products around the base of the tree. Tanglefoot has been around since 1885 and offers great products to get rid of pests. One of these is a sticky band that traps the ants at the base of the tree and prevents them from doing any further damage to the tree.